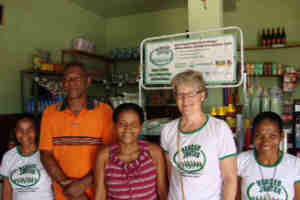 Vencer Juntos (Portuguese for Winning Together) is a non-governmental project that develops entrepreneurial talent among the very poor in Brazil. 1. What prompted you to start VencerJuntos.org? Barbara: My work with UNICEF inBrazil1987-91 and with Women’s World Banking in 1992/93 convinced me that microcredit was not reaching the poorest among potential clients. There is an unserved niche of people trying to transition to get off welfare and join the productive workforce. In places where there are no jobs, these people have to start their own small businesses but don’t know how to go about this. These people need a package of services: consulting to identify a business opportunity and develop a business plan, start-up financing, management training, and continued consulting through the first five years of the business. Vencer Juntos provides this package of services and, in the process, promotes the creation of community revolving funds that, over time, will be managed by an organization formed by the first clients to keep the project going. In founding Vencer Juntos, I was hoping to apply the best practices of business (which I learned through my training atHarvardBusinessSchooland in my eight years of corporate consulting) to the not-for-profit sector. I felt a strong “calling” to be a social entrepreneur, an aspiration for which I prepared myself for many years of training (graduate degrees from Yale and Harvard) and professional experience. I also prepared myself financially in the sense that I saved a large portion of my corporate salary from 1993 to 2002 in order to have a reserve and be able to accept a significant reduction in compensation by becoming a social entrepreneur. Barbara: My work is divided between working from home, working at the organization’s head office, or doing field supervision and training. To start a day in the field, I generally will take an overnight bus from Salvadorto the interior of the state of Bahia. One project region requires a 13 hour bus ride, the other one a six hour bus ride. I try to get some sleep on the bus, because work will begin shortly after my arrival. After a cold shower to wake up and a breakfast with some strong Brazilian coffee, I’ll greet the two or three people on my local team and the leaders of the local association. We spend the day together in a workshop, for example, to prepare the association’s annual budget and fundraising plan. I ask the leaders to list the association’s planned activities for the year, writing the answers on the flip chart. Then we develop for each activity a list of expenses and estimates for each expense. My role is to ask questions to facilitate the discussion, it’s the local leaders who are supposed to develop the plan. The workshop will end at about 4 PM. After that I’ll sit down with our local staff to evaluate the workshop, discuss other local issues and problems and plan follow-up activities. At the end of the day, around 7PM, I’ll check my emails and respond to the urgent ones. I go to sleep early to make up for lost sleep during the over night trip. A day of work from home is like this: Get up around 6:40, take a shower, have breakfast, turn on the computer at around 8:30. Write emails for about 40 minutes leaving instructions for staff. Then do some writing: either write a project proposal or a report to funders, or do monitoring, generating reports from our information system to analyze how we are doing. Have lunch around 1:00PM, after lunch check emails and respond. After that, a skype call or phone call to someone on the team to discuss things that need to get done. At 4:30PM, take a break to go for a swim or walk. At 6PM return to work on the writing or analysis. 8:30PM one last check of emails and responses, so team members will have them at the beginning of their day. Webmail, which allows me to access my email from anywhere and back up important files on the server. Microsoft Office (primarily Word and Excel) and Skype for communication. I don’t yet use a smartphone, only for mobile phone service. Barbara: I make a detailed to do list, look at it every day and cross off items that have been completed. I think about which tasks I need to complete so other people can do their job vs those that only depend on my input and prioritize the former. I try to delegate tasks that can be delegated. I try to start tasks with plenty of time before the deadline instead of waiting until the last minute, however, I often don’t succeed in that because other urgencies come in between. Develop and maintain an excellent reputation, it will be your greatest asset. Building a strong relationship with government agencies, obtaining government funding and participating in networks with other NGOs to influence public policy in ways that will favor my project and its clients. Building relationships with private sector donors and foundations. This second piece of the strategy has not yet been implemented and needs to happen this year. Get funding from our clients by way of the promotion of revolving funds to give partial sustainability to the project. Barbara: Achieving continued funding and support for Vencer Juntos for the past decade, and thereby expanding the program from initially four to currently eleven project territories. Today Vencer Juntos is recognized as one of the leading and best organized Community Revolving Fund programs in Brazil. I have become recognized as an authority on this methodology sought out by the government as it develops public policies to replicate these types of initiatives in all of Brazil. Barbara: I exercise and try to keep at least one weekend day free without doing any work. When I work from my home in Salvador, Bahia, I take a break at 4:30PM to go for a swim in the ocean or for a walk on the beach to watch the sunset. Then I go back to work from 6PM to 8PM. On weekends, I start my day with a long walk or run on the beach. Living on the ocean, enjoying an ocean view from my apartment and having the beach in 10 minutes walking distance has been a huge boost to my quality of life and balance. My religious practice and my faith has been another important contributor to balance in my life. Barbara: The founding and running of Vencer Juntos. My college professor of international relations. He was from Bangladesh and awoke my interest in and awareness of international development issues prompting me to choose a career in that area. My father, who encouraged me to choose leaving my corporate career and returning to Brazil to found Vencer Juntos rather than accepting a tempting corporate job offer and promotion. My long-time boyfriend who encouraged me to go to Harvard Business School. Barbara: You will need a lot of patience and perseverance to take your venture from a great idea to a functioning business. There will be obstacles and setbacks, and you’ll need a lot of passion and conviction to overcome them. Many people have great ideas, but the key is knowing how to execute. Don’t expect glamour or fame, most of your time will be spent working away in the trenches and on the details. Find good partners and good people to work with you, don’t go it alone. Several heads together think better than one on her own.